Game description: In this installment of Tales of series, you play the role of the 18-year old Veigue, an orphan who grew up in a village together with Claire. One day Claire is kidnapped by a group of soldiers who belong to a mysterious organization. Veigue and his friends embark on a journey to save Claire, but soon the plot evolves into a conflict between humans and Gajumas, beast-like creatures with their own culture, and Veigue and his friends must restore peace in the world. The game abandons the free-roaming combat of Tales of Symphonia, and returns to 2D combat style of earlier Tales of games. You can move on three horizontal lines during the battles, and attack enemies in real time. Other party members can be controlled by the AI, but you also can choose to assign general commands to them. The game includes other challenges such as cooking healing items for yourself. 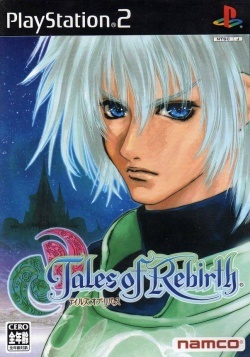 Tales of Rebirth features real time 3D backgrounds with 2D animé-style character and enemy sprites. Europe v01.60(19/03/2002), Recommended, Enable fast CDVD, None, Game runs perfect, framerate is smooth and stable in both hardware and software modes., HW mode with texture filtering enabled only: Sprites, enemies during combat in particular, contain some black lines. Not fixed or reduced with sprite hack.